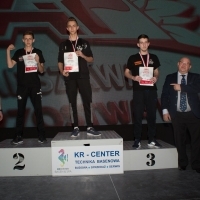 These sportsmen particularly didn’y get from the last year all that they wanted but anyway, Krasimir Kostadinov and Ermes Gasparini definitely had a success! Both of them showed their best at Zloty Tur and make us sure that they are the strongest. Krasimir Kostadinov: “2016 was great year for me! Hope 2017 to be even better!!! I am very happy that I managed to beat Ivan Matyushenko with left and Rustam Babaev, Genady Kvikvinia and Levan Saginashvili with right. I couldn’t win Europeans and Worlds with right and I was aiming for gold in the Open category of Zloty Tur but that also slipped away from me. Ermes Gasparini: “2016 was for me a year full of success after so many sacrifices. My biggest success was surely win at the Zloty Tur beating the legend Rustam Babayev and finish in the top four in the world. In this year could only get better, I would not change anything. Even after the defeat, we must never give up, this is the wish that I make to all those who follow me and to fans of this beautiful sport”.